By nature, I’m a moderately social, chatty type of person. But by occupation, I’m a loner. It’s really just me on this side of Needle ‘n Thread, so when stitching, designing, writing, blogging, editing photos – everything I do that’s Needle ‘n Thread-related – I’m alone. But for many reasons, I never consider myself alone. When it comes to the needlework world, I’m definitely not alone! And when it comes to my work, I never feel like I’m alone. Sometimes, I choose to work in silence so that I can think about things. During those times, I often end up carrying on splendid conversations with myself! But usually, I’m a listener, and especially when I stitch, I get in a lot of listening. Over on my Needle ‘n Thread Facebook page recently, I brought up the subject of listening, and that sparked some conversations with friends about the hows, wheres, and whats-its when it comes to engaging, high-quality listening experiences. 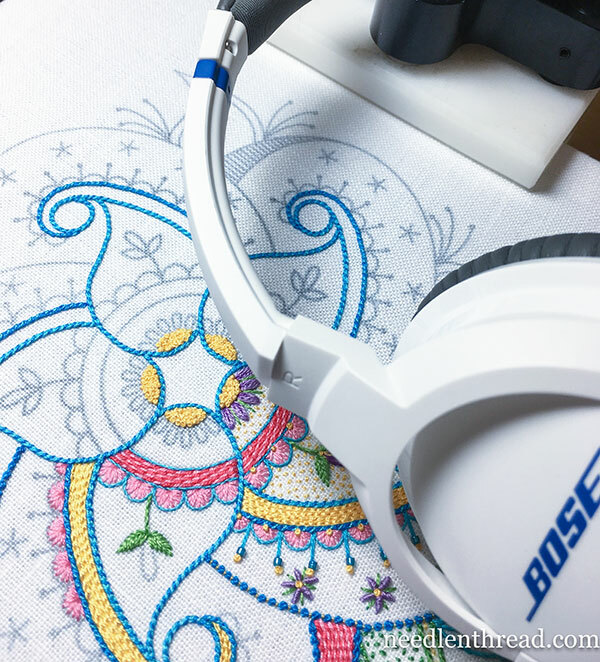 In the needlework world, there are many different popular types of listening while stitching. First, there’s the wonderful world of face-to-face, real person listening, where you get to stitch with a friend and chat, listen, exchange ideas, hopes, dreams. But that lovely situation aside, let’s talk about listening when you’re a sole stitcher. The most popular “listening” device out there seems to be the ubiquitous TV. Most stitchers admit they don’t really watch it, but rather listen to it while they stitch. I can’t do TV or movies while stitching. I often wish I could. Since I’ve lived most of my life without television, I’m not desensitized enough to the screen experience to be able to split my attention. If something is flashing about on a screen in front of me, I’m pretty much mesmerized by it. So I’m not a watcher-listener when it comes to TV or movies and stitching. Instead, I’m solely a listening-listener, and an avid one at that. Lately, podcasts and music might be neck-and-neck. But audiobooks definitely take up the majority of my ear time! You can find audiobooks either free or at affordable prices in a number of places. Librivox, for example, is a public domain audiobook resource. Amateur readers read public domain books that you can listen to right on your computer, or that you can download and transfer to a device, like an mp3 player, smartphone, tablet, etc. You can also burn the files to CDs and listen to them on CD players – but these days, that’s a rather archaic approach. It’s easier just to put them on your mobile device and then remove them when you’re finished with them. The public library system in the US (and I would also imagine in other countries) offers audiobooks as well, and depending on your local library, you can acquire them in different ways. You can check out a set of CDs (again, this is becoming archaic in many places) or you can log in to your library account and “borrow” the audio file online for a set time. When you’ve finished the audiobook, you can delete the file, or, if you go beyond your borrow date on it, you can either renew it, or check it out again later to finish it. Overdrive is one of the main platforms for finding library lending of audio and electronic books, and is worth a browse to see if your local library is accommodated in its structure. I’ve not used it myself as my local library isn’t supported, but I’ve heard from people who use it and like it. Spotify is a subscription audio (primarily music) service that you can get for free (you have to put up with advertising) or that you can pay for monthly. The paid version gives you loads of freedom in selecting music, constructing playlists, and the like, and it’s free of advertising. For Spotify fans out there, did you know they have some audiobooks on there? The few excerpts I’ve heard are fairly good – they were mostly children’s books and short stories, though. Personally, I don’t use the service, because it’s spotty (pun intended), especially lately, and because it’s a constant streaming service. If you have wifi, it’s ok for home, but if you’re out on the road, you’re using data while you listen. Audible is the foremost vendor out there for audiobooks that you purchase and keep. While a member of their service – at $14.95 / month for their basic service (which gives you one book credit a month) – you have access to all their audiobooks at deeply discounted prices, plus they run specials throughout the year that will give you more bang for your book buck. If you drop your membership, you still keep all the books you’ve acquired. I’m admittedly an Audible junkie. For me, it’s not only about the words of the book. It’s the whole listening experience. Narration plays a huge part in bringing a book to life, and the professionally produced audiobooks through Audible – read usually by top actors with great voices – helps produce a stellar audio experience. 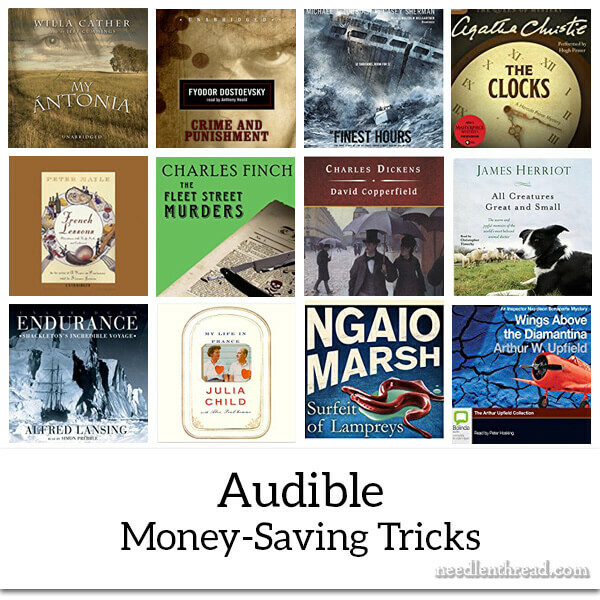 There are tricks to using Audible, if you want to be financially efficient about the whole thing. Right now, when you sign up for the free trial (the sign up offer varies), you get two free credits, which translates into two free audiobooks. Essentially, it’s one a month for two months. After that, the cost kicks in at $14.95 / month for one credit, or one book. However, you can cancel after the free trial if you want – so you’d get two free books out of it. If you hang on afterwards, you get a book of your choice per month for $14.95, which is a far sight less than you’d pay for the same book outside of membership. And your credits roll over, if you don’t purchase a book in any given month. Throughout the year, Audible offers sales (like their $4.95 sale or their three-for-two sale) to members, which are a pretty good deal if you can find books you like on their sales lists. There’s always a good variety, so you’re bound to find something you want to listen to! All that said, and as nice as it is, the monthly fee of $14.95 is not the most financially savvy way to enjoy Audible. Audible’s best deal is actually their yearly membership (platinum level) for 24 credits. This membership level costs more up front, since you pay at the time of signing up for it and receive all 24 credits at once. But it reduces the cost of each credit (or each book) to less than $10 per book, and that’s quite a substantial savings if you go through a lot of audiobooks. I’ll admit I’m a pro at finagling the yearly membership from my family as a Christmas present. It’s the only thing I bother heavily hinting about! To get the yearly membership, after you’ve signed up for the regular plan or the free trial, you go into your profile and adjust your membership plan to the platinum, or yearly 24 credit, plan. Twelve of the 24 credits roll over each year, so if you only use half your credits in a year, you still have the other half the next year, as long as you’re still enrolled in membership. If you find you can’t use that many credits the next year, you can switch to the monthly plan again and still retain the roll-overs. I usually end up easily using 24 credits in a year, because, like I said, I’m an avid listener! Audible’s return policy is a Huge Plus about their program. It assures a quality listening experience and a good value for your money. Essentially, if you don’t like a book you’ve purchased through Audible for any reason and you feel you wasted your money or a credit, you can return it and get a refund or a credit within a year. Because of this policy, I never feel stuck listening to bad narration or a disappointing book! I’ve returned audiobooks through Audible for any number of reasons: bad narration, low or sordid content, inaccurate content (historical works of fiction or non-fiction that are anachronistic or poorly researched rub me the wrong way), poor writing, or content that just strikes me as really lame. If I don’t like it, I don’t keep it. If you’re a member, it’s worth using this policy to your advantage, to build a library of audiobooks that you’re happy revisiting again and again. You can use your credits to gift audiobooks to other people. I’ve done it numerous times with books I love, that I think someone else will love! It’s an affordable way to give a really nice gift. I have a fairly broad range of book preferences, so I’ll just highlight a few favorites that I really enjoy. Literary Classics: This version of Anna Karenina narrated by David Horovitch is excellent. If you like Elizabeth Gaskell (think BBC’s Cranford and North and South), this narration of North and South read by Charlton Griffin is well done. You’ll also find plenty of Jane Austen, Dickens (including full-cast audio productions, which are thoroughly entertaining, if you like Dickens), and pretty much any classic author you love. Mysteries: I like mystery and suspense, including cozy mysteries, which tend to be extremely popular. Agatha Christie’s books read by Hugh Frasier are perfect. I also like Ngaio Marsh, Dorothy Sayers, and practically all those writers from the Golden Age of Mystery. A relative newcomer to the cozy mystery scene is Charles Finch. His Charles Lennox books are set in Victorian England, and they are extremely well researched, well-written, and well-narrated. Travel: Peter Mayle is a favorite – think: A Year in Provence – as well as many other travel journalists and travel story-tellers. Bill Bryson, for example, can be quite engaging. Non-Fiction: There are so many choices in non-fiction – lately, it’s my favorite category. Lots of excellent biographies, autobiographies, histories, and adventures. In the stories of survival category, Michael Tougias’s maritime books are excellent. The James Herriot books are fun, relaxing, and entertaining. Really, there are too many to list in this category. There are some self-development books I’ve listened to with benefit, but admittedly, it’s not the most exciting category. And I’ve delved into the world of children’s literature – there are countless wonderful children’s books on Audible that I’ve listened to alone and with my nieces and nephews, too. I have a pretty extensive personal library of classical music and folk music, so I don’t often use music streaming services. Amazon Music for prime members (without the paid subscription) is ok, but not great. And once a year, I sign up for Spotify from December through February, when three free months. For podcasts, I use iTunes to subscribe to ones I like, especially in the categories of textiles (needlework, stitchery, etc) and travel, and a few that have to do with the technical side of blogging. Whether you use an Android device or iOS, there are plenty of apps for subscribing to podcasts that fit your interests. You can also listen to most podcasts through a web browser at the podcast’s home page online. As far as textile and needlework podcasts go, I listen to FiberTalk, Stitchery Stories, and there’s a new-to-me podcast called Thread Cult that I’ve listened to (it’s geared towards sewing, predominantly, and the fashion and couture industry, from what I can tell so far). So, what do YOU listen to when you stitch? Do you have any favorite series of audiobooks, or any recommendations for finding good listens for stitching sessions? I’d love to hear your recommendations! If you have any input, questions, comments, suggestions, feel free to join the conversation below! This article contains affiliate links, which means that Needle ‘n Thread receives a small kick-back if you purchase items through those links. I’ve been an Audible member for hundreds of books, use the library for more (they have these “play-aways” that are preloaded MP3 players that just need AA battery and headphones), but have been a judge for The Audies for the past few years. I was sent over 70 books so far. My car can’t move without a story going, I listened to 8 Sookie Stackhouse Southern Vampire Mystery books after hand surgery, and have relistened to Diana Gabaldon’s Outlander series with brilliant narration by Davina Porter. It’s a happy day to stitch and hear a good story! I look forward to reading your posts, love your work and your tutorials. Would you please share your favorite textile-related podcasts? Hi, Mary Jane – FiberTalk and Stitchery Stories are both good! They’re my favorites so far! I loved the article. Listening is so important, as is on-going education. I use my iPod at the gym to listen to podcasts, usually educational (I like history) or current affairs. But at home we listen to the radio, usually NPT, much of the time while we do housework or other things. So often when I stitch, I’m also listening to an informative program on an interesting topic. Everyone should check with there local library to see if they subscribe to Hoopla. It offers audiobooks in addition to movies and music and regular books. You check out the books , but get them for three weeks and can check out 10/month. Unlike Overdrive there is no waiting for a book. If your local library doesn’t subscribe to Hoopla, it’s worth looking for other nearby libraries that do. Mine doesn’t, but I buy a card for $25 a year at one a few towns over, and that gives me access. Check the library websites. I do get overly distracted by the television if it’s playing something new to me, but I have found I can just listen to shows or movies I have already seen. So I frequently stitch while listening to TV shows that I enjoyed watching with my husband. Currently I’m working through Leverage on Netflix. I was about to mention the same. It is a lot easier to avoid getting distracted by the screen if it’s something one has seen before. Personally it also helps me to have it on a small screen like my laptop instead of a big TV screen. To Caitlyn – if you like G.K. Chesterton, and like podcasts, he has a wonderful one (that must have been recorded quite a while ago) called A Short History of England. For an OS or iOS device, you can find it in the Podcasts category of the App Store. You can also probably find it in iTunes, though I don’t find my podcasts that way. Melissa – A Short History of England was a book published in 1917. I see Librivox has a version, so I’ll check that out. Thank you for such an interesting news letter I have been a member of Audible for a number of years it so easy to download their story’s onto my iPad. One thing you did not mention, but maybe you don’t have the option in the USA Is that in the U.K. we can take up to a 3 months holiday which I find very useful especially in the summer. My choice of reading is a bit mixed usually fiction, histricle romance expcially set in the 2nd WW, light detectives and stories by Alan Titchmarch who is not only one of my favourite authors he also reads his own stories which usually have a touch of humour. I’m also a huge Audible fan and have been a platinum member for years. Since my husband and I both listen to audio books, and rarely the same ones, we go through our credits fast. Audible doesn’t offer a Stratospheric plan, but they do offer an opportunity to buy 3 additional credits when you use up your regular two. The cost works out to be around $11 something a book. I’m just now finishing A Dance to the Music of Time by Anthony Powell, fantastic. This is in my library. Do to your review, I may listen to it next. I’ve enjoyed looking at your list of recommendations. Is Amazon selective about affiliation? For example, Dorothy Sayers is not linked but is available on Amazon and appears to have the same availability as Ngaio Marsh which is. I’d like to think you got credit for that as well. I’m so glad to see this. I can read and do tapestry at the same time but I cannot do my current interest, crewel, and read. I personally prefer the sound of silence. I’m the same way as Mary with TV — when it’s on, I’m mesmerized. And so with books — I get totally wrapped up in the printed word. (Thanks for the free audible book site!) I will add another streaming music app: Pandora. Like Spotify, it’s free with ads, subscription without ads. I also will listen to the radio thru my smartphone such as IRadio app and individual stations with a streaming website. I’m sure there are tons of other sites. We are so spoiled with TV, radio, internet, smartphones, Bluetooth, e-readers etc! I’ve tried audio books, but they put me to sleep! I’m not sure why. When I read a paper and ink book, I can read for hours and hours and normally don’t fall asleep. But if I do, I can easily find my place when I wake up because the book is open in my lap to the place where I fell asleep. But when I listen to an audio book, it’s not long before the sound puts me to sleep. And the book keeps going on and on while I’m sleeping, and when I wake up I have to spend time backtracking to figure out where I left off. So, at this point, I stick with paper and ink books that I can hold and pages I can turn and I can stay awake for! Listening to an audio book when I’m stitching keeps me awake. If I’m not doing anything, they put me to sleep, and, in fact I use them to do that if I want to sleep and can’t. I thought that was my own discovery but find that it’s pretty common to use them as an insomnia cure. It works best with something where you already know the story and that isn’t too exciting. I am an Audiobook aficionado and listen every time I get in my car as well as while cleaning house and stitching. I rarely listen to the radio anymore. Of the hundreds of audiobooks I’ve listened to I think my persona favorites are The Harry Potter books and The Sparrow/Children of God books written by Mary Doria Russell. I have listened to them more than once which I normally do not do, there are so many out there to listen to. I am an avid reader, and some days this is the only “reading” I get to do. If you read the Audible Terms of Agreement you can remain a member for about $10 a year. You do not get any credits on this plan, but you still receive their sale emails. I found this to be a better option for me as I wasn’t using my credits fast enough. Not too mention that i also read in other formats. Amazon Prime members have access to ‘Channels for Prime’ located in the Audible application. Members can listen for no extra charge. On the downside you have to pay an annual fee to be a Prime member. However, in my opinion, there are so many cool benefits the cost is worth it. Great help. I was one that never knew about where to get audio books. So excited to multi task 2 of my favorite hobbies. I love audible. I listen to books whenever I have a long drive. It makes the hours fly by. I watch movies I have seen a hundred times before when crafting – I love these movies, but if a miss something, it does not matter. I like Pandora for streaming music – but don’t use in your car or you will pay lots for data. I’ve started breaking out my old vinyl albums and enjoying the sounds of my youth while stitching away. I’m a tv watcher while I stitch! But really bad tv, so i don’t really need to pay attention. Right now I’m on Charmed. You know that 90’s show about witches. Definitely a guilty pleasure. They really loved morphing people into other people/monsters/animals back then. In reading your authors, I find that we have several in common that we both like. I thought I would suggest an author that I am very fond of. She writes murder mystery novels. Her name is Louise Penny and I am hooked! I find that the murder is perfect, her development of characters outstanding, and her writing is superb. You need to start with her first book if you give her a try. Her detective is Chief Inspector Gamache. It is a series that builds upon the book that came before it. The first book is Still Life. Once you discover the little village of Three Pines, you will want to return again and again. I hope you try her as you sound as avid as I am when it comes to audible books and murder mysteries. . As you can see, I am a fan! I love National Public Radio for informative and entertaining listening. Thanks for another great post. I love audio books and I listen to two or three books a week. I mainly use the public library. I live in Chicago so it is a big market but we have Overdrive, Hoopla, and RB digital to get free books from. Since you do not have this available in your library system, look around and some libraries will allow you to buy a library card. In Lee County in SW Florida you can buy a non-residents card for a year for $60.00 and I am guessing others will allow something similar. I’m an audible junkie too!! One thing I love about it is the “whispersync for voice” feature. You can get the kindle book and the audible book and switch back and forth seamlessly between the two. I do that within the Kindle app on my iPhone – listen while driving in the car and then switch to reading when I have spare moments and putting in my headphones isn’t a good option. You can also use the audible app but it will have to sync back to the server to get to your spot where you were reading so it’s a little bit slower. My husband and I are heavy Audible users for the last 10 years. I couldn’t have survived a commute in Atlanta traffic without those books and now that I’m retired, I cannot stand to cook or clean or sew without Audible going in the background. Thanks for the recommendation re Charles Finch, cozy mystery writer. We’ll be looking him up. And thank you for your ever enjoyable, informative and useful posts. I’ve relied on them for years, as well. I love my old black and white or old colour films which I have taped and watch while I am sewing. I like audio books as well and listen sometimes to BBC period drama iPlayer. I love Jane Austen and I am really into Persuasion at the moment I love it and Northanger Abbey is another favourite as well as Pride and Prejudice. I also really like Agatha Christie Miss Marple and have 13 CDs and of course Poiret Evil Under the Sun is a favourite. I like televised historical documentaries as well. Music I very rarely listen to as I like the visual. Thanks for sharing with us what you listen to when stitching and for the links to all the various audio listening. I hope you have a great weekend. Without a doubt BBC Radio 4. I also stitch in solitary but radio 4 keeps me informed and entertained. Couldn’t do without it. I was very interested to hear about your listening habits. I don’t have a TV myself so when I’m around one, as when I’m visiting my sister, we usually go in another room so we can stitch and talk or I get a chair where I can’t see it very well because I find it very distracting while stitching. At home, I listen to the local NPR station at lot. Unfortunately, several years ago it switched from mainly music to all talk….so, I can listen to informative & interesting programs while stitching. If I need a change or get tired of the topic of the day, I have a very large collection of CDs. I’ve never gotten into listening to books but I know my local library has a large collection of books on CDs, hoopla and some other download services. On another topic, thanks for showing the views of your workroom, storage etc. I am finding this most interesting and even inspiring. Audio books all the time. Familiar stories when I’m doing something that needs concentration so that when I come to a stitching break I can easily pick up the story and new, or less familiar, books when the stitching is more straightforward so I can listen more closely. Ideal for me. Like you, I don’t or can’t watch TV while stitching. I do listen to ‘BBC Radio 4’ on my computer as I stitch. http://www.bbc.co.uk/radio4extra/programmes/schedules. There are dramas, short stories, mysteries, comedies, many of them in series form. Right now they are airing ‘Rumpole of the Bailey’ read by Benedict Cumberbatch. It doesn’t get any better than that! You may want to check it out. http://www.bbc.co.uk/programmes/b03y3kgs#play. (Rumpole is on 4 extra) Both stations are good. I am a big fan of listening to Audible and find the narrator makes a big difference in how I can listen. I listen to the mentioned needlework podcasts, but also listen to a wide range of others, especially history for some reason. I recommend Revolutions as an excellent place to start. I also belong to The Great Courses Plus. I’ve bought the mp3 downloads of many Great Courses offerings over the years, but find the GC Plus subscription a good option. Mostly for streaming at home, but you can download to phone for offline listening. These are video lectures – occastionally there are maps or illustrations to look up for, but generally they work as audio and cover a great number of intersting subjects. I find listening to audiobooks helps keep me going especially when I am chain piecing a long line of triangles, etc. Some of my favourite authors to listen to are Georgette Heyer, Elizabeth Peters, Jana deLeon, Jacqueline Windspear, Kerry Greenwood and so on. I enjoy your site and your thoughts and ideas. With regard to Georgette Heyer, to you listen to the romances or the mysteries? I like both but have only listened to a couple of the mysteries. Her dialogue is so funny, can you stitch and guffaw? Thank you for all the information on Audible. I just received a 3 month subscription as a birthday gift from my son and I can’t wait to explore the site. I love to listen as I sew, quilt, or do embroidery. Your suggestions will help me get started on my Audible journey! I have been a regular listener to audiobooks via Audible for nearly 10 years. Some of my favorites are YA books by Tamora Pierce — especially the Winding Circle series with Sandry the thread mage (and her adopted siblings). Some of the pieces I’m currently planning are inspired by pieces described in the books! Thanks so much for all the details about Audible. I’ve been wary but now might try it. For a long time I’ve made use of my public library for physical CDs and the Overdrive played MP3s and have come to load a couple of weeks worth of listening to my device when preparing to travel. I really appreciate you suggestions on authors! I’m always looking for more as I go through a lot of audio time. My own favorite is Dorothy L Sayers where I prefer the unabridged narrations, but still enjoy BBC radio renditions. I also relisten to George Guidell reading Lilian Jackson Braun’s “The cat who …” books. It could be because of his voice …. PD James mysteries. “Airport books” (the kind of paperback you by at the airport) by Michael Connolly and Grisham and Baldacci and Dan Brown. I admit to listening to (even repeatedly) the Harry Potter books and anything else read by Jim Dale. Also The Lord of the Ring and Hobbit books, though finding unabridged versions is challenging. I’ll be interested to see what other folks enjoy! Of these, the most powerful works were by Dickens, Faulkner, Melville and Beckett. The most fun were The Help and Dahl’s The Witches. However, recently I start my day, as I needlepoint (raised embroidery), with the New York Times’ The Daily, which I absolutely love and recommend to everyone. I’m copying your list, though we have several of the same ones. Another audible book resource is “SCRIBD”. This program is similar to Audible. However the monthly fee is less and you have access to non-audible books, published articles, and magazines. Just finished listening to audio book “Nightingale” which I highly recommend. I love Audio Books. They have a program with Kindle books that matches books you already own with Audio Books for a VERY low price. In this format you can read or listen or both together. The problem I encountered was walking around with head phones, Kindle, and needlework supplies so I made an old sweatshirt into a Kindle carrier. I made a buttonhole in the front of the sweatshirt for the headphone wires. Then I made a big pocket and sewed it on the front of my sweatshirt over the buttonhole. I thread the headphone wires through the buttonhole and inside the sweatshirt, put the Kindle in the pocket, a bit of Velcro along the edge of the pocket and I am good to go. I can bike, run, walk, vacuum, stitch, life is good. I hope this makes sense. You are speaking my language Mary. Stitching and listening is my favorite thing in the world, my heaven.im in 2 bookclubs, and I get to read through listening. Anna Karenina is a all time favorite. Just a note about Spotify…You can use it on the road or even in a plane without wifi and without using data services. There is a “button” next to each selection or playlist: “download.” In other words, you download it onto your phone and it’s yours to use anytime, anywhere even when you don’t have service. I have found this to be quite convenient. You cannot transfer it to another medium, but it’s still helpful. I pay for membership; I don’t know if it is the same for the free service. My listening is our ABC Radio National. They have a great range of subjects and when I get tired of the chatter I switch off. Even with the music. At night I can just sit and sew. I like listening to the silence. I might sometimes stop sewing and I have a look at the news. As it is nice and quiet I might type out a couple of pages of poetry or thoughts. Letter to the editor or to Conversations which covers politics, medicine and other subjects that are in the public eye for the moment. I have found that I can’t do anything to quiet down before bed and if I just sit, I have to think. If the sewing comes into mind I have to get back to that. Audio books are too expensive and even those I find distraction. There is swap library here for Audio books. A lot of the distant haulers love to listen to them. I do occasionally fall asleep if I sew and listen to the radio or music. I just think that, what ever you do, is right for you. Time here in Australia. Saturday morning 2.19am. Thanks for the suggestion of Charles Finch and his Charles Lennox book. I’ll get that one for sure. Thanks for the hint on Podcasts; I’ve known about their existence and have frequently planned to listen to something from our National Broadcasting entity, the CBC, but never seem to get around to setting it up. I will now. And Audible is the most fantastic vendor/service that I know of for ANYTHING! I don’t mean they have anything, I mean of all the vendors and services out there for any type of product Audible is a the very top by a long shot! I starting using Audible back in 2010 when I was diagnosed with a very serious illness and the treatment left me far to tired and weak to hold a book. Reading is/was my ultimate time-passer and I was so happy to find Audible. I now own over 300 audible books and can’t say anything bad about their service. I would never have been able to afford the prices in the stores for CD’s and the choice is limited. As you say their return policy is exactly as advertised. I routinely return books that I find the narrator/performer is not quite what they sounded like on the clip they give you to sample. I have never had an issue with it. A fabulous company. I’m glad you are sounding so positive and wish you good health and enjoy those books. I’m an Audible fan too! Listening keeps distracting thoughts from running through my mind while I am stitching. I’m going to follow the comments associated with this subject…I need more authors to follow. I enjoy Louise Penney’s Inspector Gamache series. They are about a police detective from Quebec Province…it’s recommended you read them in the order they were written. For Regency fans, Georgette Heyer is the Queen…she was a historian, so they are fairly accurate. I did return one last night because I didn’t enjoy the narrator. I also search by favorite narrators. I like Kate Readings narration of Elizabeth I. Sleep aid…if I can’t sleep at night, I listen with ear buds…it puts me right to sleep. I’m a BBC I player fan. You get a wide variety of programs to listen to. I’m hooked on their drama’s and comedy offerings, but listen to most types of program. I used to listen to books on long car journeys but don’t travel around much these days. Quite often have music in the background if I’m likely to have many interruptions. Think I will start using audible books again as I’m running out of storage space for those books I want to keep. What a treasure trove this column is! Thanks, Mary, for all the information. I am a long-time Audible member but never knew about the 24/year option. I want the second Louise Penney novel and I am out of credits! And some of the other suggestions are great. The comments have also been very informative. I have been listening to Alexander McCall Smith, both the Ladies Detective Agency and the 44 Scotland Street series are wonderful with really good readers. But I have not considered listening to my favorite Victorian novelists which were, after all, meant to be read aloud. Thanks, Mary, and thanks to all your reading, listening, stitching fans for the suggestions. My grandmother was legally blind from severe tunnel vision when she began to teach me emboidery; I was 6 years old and have had a needle in my hand ever since! Gramma introduced me to the wonderful world of audio books that same summer (1964), and I’ve been a keen radio and audio book listener ever since. I seldom enjoy one without the other! Bless the CNIB (Canadian Institue for the Blind) for their fabulous books-on-tape system and bless Gramma for passing along her two favourite passions to me! I know this is off topic but I really noticed how your lighting for the photo in this article made your colors more harmonious (I think you got the yellow right) when I compared back to the previous article! I get a little sleepy listening to audiobooks, I’m more background noise or none at all. I have a screened in porch that lets me sit outside if it’s not to hot or cold so whatever is happening in the neighborhood (mostly birds and dogs) is it. I love all the information you have shared. Although I admit I have no trouble “watching” a movie or television show while I work (usually old favorites, not things that are very suspenseful or things I am extremely interested in), I LOVE audiobooks! Audible is a good service – although with taxes and other fees the 14.95 monthly fee is more like $16 (at least for me), you can still use your credits wisely, and if you have been enrolled for three months, you can buy three extra credits for a lower price each. Like you, Mary, I find the return policies very helpful. I only keep books I know I will re-listen to. I can heartily recommend the Patrick O’Brian Aubrey/Maturin adventures as read by Patrick Tull; and also, the entire canon of Sherlock Holmes stories and novels recreated as radio plays with Clive Merrison and Michael Williams. Librivox is wonderful! I especially prize a splendidly animated recording of “The Man Who Was Thursday,” narrated by Zachary Brewster-Geisz. Loudlit.org is similar to Librivox (although with far fewer books). Their “Heart of Darkness,” narrated by David Kirkwood, brings out the horror and the beauty of the story. The library is really helpful, too! Overdrive doesn’t have a very large collection at this point, but I have listened to some classics and enjoyed them. Another of my favorite listening options is BBC Radio 4 Extra. After their programs air on the radio they make them available for free on their website! You can listen to adaptations of classic novels (Dickens), old radio comedies (The Navy Lark), horror and fantasy (Terry Pratchett, The Twilight Zone), and more. The schedules change frequently, so you can keep an eye out for favorite voice actors or writers. I’m also a fan of sci-fi and fantasy, and Big Finish creates audio plays of brand-new “Doctor Who” stories (and Dark Shadows stories, etc). You can buy some of the earlier stories for just $3 each! These are a lot of fun, even though the acting can be over-the-top and the stories cliche at times. They also have frequent sales, and sell less expensive “bundles”. Personally, I can’t listen to music while I work. I love music, but I can only handle it in small doses: I get attached to a particular song and listen to it over and over, and then I don’t listen to anything for ages. I’m just strange like that! Thought I should add – BBC Radio has a smart-phone app, so you can listen on the go. I haven’t been able to get it to work perfectly on my Samsung 4 (it skips), but this information might be useful to someone else. Oh, and also, regarding Audible – if you are enrolled in a monthly, yearly, etc., plan you also have access to their “Channels” program, where you can listen to many stories and other programs for free if you have a smart-phone. We haven’t a television in the house for five or more years. Too many channels we never watched for too much money. I’ve subscribed to Pandora for years which I listened to at work and more often now since I retired last year. I like it because I can create my own music stations. I use Apple Podcasts A LOT! My favorites are Jerri Williams’ interviews of ex-FBI agents, KnitPicks and iMake are both handwork sites, I’m learning Spanish through a podcast, Mike Rowe has a podcast called The Way I Heard It that is typical Mike, The Black Tapes is a mystery serial. I’ve also listened to old time radio shows. There is something for every mood. I have created some lists on YouTube for some pleasant companionship of sorts. One I really enjoy is Holland Handmade. She is a visual podcast and reads letters she receives and shows what’s she’s working. She so sweet. So I have a great assortment of listening options I sew and stitch with. I love audiobooks, and recently I’ve become enamoured with getting the great courses lecture series through audible. You can buy one using your monthly audible credit and they’re really fantastic. I’m currently doing the Early Middle Ages (300-1000AD), I’ve previously listened to a great one on World War I, and one on the history of language. But they’re not all history (that’s just my pref), so check it out if you’re looking for something non-fiction. My favorite thing for stitching is a Law and Order marathon. Not much to look at and you can get pretty much everything from the audio and a “marathon” format means you don’t have to keep changing the channel. However, we cut the cord several years ago so no cable and no endless parade of L&O. I have found lots of documentaries online to “watch” while I stitch (especially since PBS puts up everything they air the next day). One only has to look up intermittently and even then, only if it’s a program about something particularly visual like art, physics or a battle with lots of complicated maneuver charts or they are interviewing someone in a foreign language and there are subtitles. Thanks so much for this information!! I’m an avid reader never listened to audiobooks until a few years ago when I purchased a new car that came with a 3-month subscription to Sirius radio. I quickly found the Book Station and fell in love! I only have an 8-minute commute to work, but I was able to pack in much more ‘reading’ time. Unfortunately, Sirius dropped that station and I admit I threw an “ever-loving-FIT”. Anyway, I checked out Audible a few times, but it seemed too expensive. I was just looking at the full price of the audiobook, not the credits. I joined a few months ago and really do not care how much it costs, I’m hooked. Thanks for the tips on saving more, though. I’m on my way to change my membership right now. Oh, and wouldn’t I just love to sit and stitch with you and chat all afternoon . . . sigh. What a nice discussion. I just downloaded MetOpera from iTunes because it’s Mozart and only $0. 99. (Cosi Fan Tuttle) So 3 hours of Mozart for this weekend (and football). I also binge on Netflix. I use the movie as a talking book. I especially like Agatha Christie’s “Poirot’ series. Each episode is about 2 hours. I look up once ot twice to see who is whom (or who is who). Or what is what towards the end Of the episode. Entertaining listening while sewing. Again thanks for your kind spirit and the help you give us all. Through Audible, can you also borrow audio books, or just buy them? I really don’t want to own audio books, but just borrow them. The waiting period is too long at the public library for recent books so I would like to find a low-cost service to rent the audio books that I can’t get at the library. Hi, Joan- it’s not a rental service, unfortunately! Perhaps someone can chime in with other options along these lines? We get audio books at Cracker Barrel. You basically rent them since you pay full price and get a refund when you return them. Great for listening on long trips. My favorite Jane Austen reader is Juliet Stevenson – far and away an excellent reader. George Guidall is an excellent reader. Jim Dale is possibly the best reader ever. He does children’s books – Harry Potter and he is remarkable. Wish we could read a book and stitch at the same time! Do the Audible files take up “room” on your computer or are they “stored” somewhere else – like the Zinio magazines? They are stored in your Audible library somewhere known only to Audible – like Zinio. You download whatever you want to your device local library, whenever you want it. Being a librarian and a rabid stitcher, I love my audio books! Our library has thousands of downloadable titles via Overdrive plus a large collection of titles on CD. Check with your local library and see what they have available. Then you can spend your hard earned $$$ on more needlework supplies. Also remember that your local library has needlework books in their collection. And if they don’t have a specific title on the shelf, most libraries will borrow it for you from another library at little to no cost. Just ask your librarian if they can do an ILL (inter library loan) for you. i listen to books and music on my kindle . if you down load the book before you leave wifi you can listin any were and not need wifi and it does not use data i have done this on trip across county and a round town when waiting for apt. love my kindle. For myself, what I stitch to depends on my mood. I can usually stitch with the tv on, providing it’s a show I like and is neither annoying, or soul-suckingly interesting. So, Game of Thrones is out, but Buffy the Vampire Slayer is in. I love both of them, but I HAVE TO SEE every second of GoT. With Buffy, I just giggle a lot. There are some excellent one-liners in that show. I have an Audible account, but most of what I download – and I don’t use it so much as I should – goes on CD to be played in the car on long drives. I can see listening to a favorite book while stitching. My preferred genres are sf/f and cozi mysteries. Music, even music I like and have originally chosen to listen to, tends to get annoying after half an hour or so. I don’t know why. But there are plenty of times when I don’t want to listen to anything, even the electric hum of the laptop. In those instances, I power down everything I can except the lights, and stitch to the glorious Sound of Silence…. and the A/C coming on, the refridgerator humming, the dog breathing heavily as she plays or snoring as she sleeps…. okay, it’s not Silence, exactly, but it’s as close as I’m going to get here, lol! Thanks for the extensive blog on music tech, etc. I, however, am trying to keep electronic device interactions to a minimum as I see all this technology as a double-edged sword – helpful to all yet very addictive. I like to have the TV on while I watch and/or listen to classic movies, TV and PBS. I like to interact with my sewing and knitting projects directly without all the electronic stuff. I do have Craftsy classes to consult on my desktop and I love to take classes where I have direct contact with other like minded crafters. Also, have a pretty good library of real books to consult. Most reading I do is away from the TV and phone. So, I’m old-fashioned and happy that way – feel that all this extra stuff is superfluous clutter to an already very active mind. Thanks for letting me vent some pet peeves. BTW have been listening to and singing music since the 50’s – don’t feel I want to have a playlist and always pleasantly surprised when I hear a blast from the past! It is so funny. I am a audiobook person looking for a hobby while I listen. I listen even when vacuuming. I am still just practicing different stitches but love to do it while I listen to a great book. I love this website!! I look for the audiobook at the library and am a member of Audible. Begravia – Julian Fellows (And I didn’t even watch Downton Abby – I think he wrote that). I have been listening to Overdrive books from the library for a long time and get a lot of stitching done. My husband enjoys a lot of sport so if I don’t want to watch the audio book is great and we can bee in the same room together I like mainly murder detective books A favourite is Charles Todd who writes the Ian Rutledge series (Thriller and suspense ) and Carola Dunn with her Daisy Dalrymple series. Thank you Mary for recommending Stitchery Stories. I’ve listened to every episode available and look forward to hearing more. If anyone is interested in quilting and fabric, as well as needlework, I can recommend the American Patchwork and Quilting Radio podcast. As a fan of audible (and its no-questions-asked return policy), I’ve been working my way through the historical fiction of Cynthia Harrod-Eagles. She has a multivolume series called The Morland Dynasty, which follows the lives of a Catholic Yorkshire family from the medieval period through the 1800s. Impeccable research and fascinating characters. I’m very low tech. I listen to NPR – public radio. My husband and I once borrowed a “talking book” from a friend, put it in the car CD drive and got so engrossed, we missed our turn and went 200 miles out of our way. It’s Audible for me, too! In fact I just bought a special offer, a Scalzi book for $2.95. I’m out of credits until the end of the month. I have the 2 credit per month deal so they are about $11.00 per book. Books are so much better than movies and TV because when something exciting is about to happen, I don’t have to look up! I can just freeze until the danger has passed. I never miss a stitch. I paint too and these books are good for that and needlework. Both activities can be lonesome, but with the books I have a great time. Of course, sometimes some friends and I meet and stitch together, but I get more done when I listen to books. Hi Mary, Are you aware that e-books have a ‘read to me’ feature. I am able to have any of the books on my Kindle (not just audio books) ‘read to me’ so long as the e-publisher has allowed the text to voice property to be turned on. (I gather they disable it to promote the sales of audio books.) Where audio books are read by actors, the read-to-me on my e-books is computer generated text-to-speech translation. In the early days this took some adjustment, but it has improved a great deal. You can choose the type of voice – male/female, European/American etc. So while I am stitching, I can be “reading” the latest of the books I have purchased. I love that your are sparse with your personal life and abundant with your embroidery comments and instructions. I usually watch a DVD while embroidering. I watch the DVD, for a specific amount of time, then embroidery for a specific amount of time. It’s sort of a built in break while embroidering. I like listening to music also, but I usually listen to it while I’m painting. Although I am not up to your level of embroidery mastery, it is good to know that someone who loves hand embroidery is making a living from it. Great article. I’m the other side the Atlantic so things slightly different for me. I can certainly recommend borrowing from a library, I have done this numerous times. Though if any more harsh local government cutbacks finding a library could be an issue for many outsude of central cities. Thanks for your continued blog entries, enjoy them immensely. I love Audible. Never considered the yearly sub – but I should! Thanks for mentioning it. I have the entire collection of Louise Penny’s Inspector Gamache series and have listened through them twice – so far. I am in love with the characters. Listening to books makes some repetitive weaving and stitching go so much faster and I tend to obsess over my own to-do list if I’m not listening to a book. This anxiousness over what I’m NOT doing makes me hop scotch all over the place and I wind up getting less accomplished. Other favorites are the Ladies #1 Detective Agency and Tony Hillerman’s Navajo detective series. I also have the Jane Auel collection that began with Clan of the Cave Bear. All of them are worth hearing again and again. I set the timer on my phone app and when the voice fades away, I consider whether to stop what I’m doing and start a different project – like dusting or vacuuming – or reset the timer. Resetting the timer usually wins out. Thanks for all the audiobook sources. I primarily use our local library for books on CD. I can access audiobooks throughout the state at no charge. Armand Gamache of the Surete du Quebec (Louise Penny)and Maisie Dobbs (Jacqueline Winspear) of England are keeping me company at the moment. Mysteries, historical fiction and nonfiction are my favorites. Children’s audio books are wonderfully done and are effective in helping young readers engage with books and become better readers. Audio books provide an excellent model for young readers who have difficulty reading with expression. I struggle with listening to things when I stitch – or at all – due to a hearing impairment; even watching TV I need to have the captions on! But I do like to have something playing in the background while I embroider, which usually means either something I’ve seen before (as other people have said) or putting on something really easy to follow (think animated movies/series etc). It’s a dilemma! I’ve been listening via Scribd and find it excellent value at $13 a month for an all you can listen subscription. It has many of my favourite Victorian titles so I’m a happy camper! I couldn’t live without our library. Oh yes, books on cd for free. Transfer them to your listening device, put them in your car cd player….any and all of these. Audible is wonderful. My husband and I also love “The Great Courses”. Where we learned a bit about philosophy and history. Current favorites, “Malazan Book of the Fallen”, “The Wheel of Time” “The Riyria Chronicles and Revelations”. Wonderful Fantasy! I usually watch/listen to tv while I stitch. Some libraries offer Hoopla which is similar to overdrive but with somewhat different content. Hoopla doesn’t limit libraries to X number of checkouts per license, nor do they have wait lists. So if 10,000 people at No Name Library all want to read The Titans Curse by Rick Riordan at once, they can. Hoopla has some audio books, and a variety of other media like comic books, music and tv/movies. The downside is a user can only check out a limited number of items per month. My library limit is 5, some people’s libraries limit to 10 items per month. And if you use a kindle (or kindle app? don’t quote me about the app), you can also turn on text to speech. It’s not as good as an audible book, but I find it quite useful when washing the dishes or driving the car. The downside is the computer won’t read some words accurately and if the author wrote a word like weeeeeird to put emphasis on the word, the narration will go w-e-e-e-e-e-e-ird (pronounce each E separately). As a resident of Kansas, you are eligible for a library card from the State Library of Kansas. They offer a fairly good selection of audiobooks that can be checked out at no cost. The checkout period is 21 days. You can keep a wish list too. Check with your local library; is they are not certain how to obtain a card contact the State Library. The audiobooks are distributed through Recorded Books. Love audiobooks! Thanks, Kathleen! I will definitely look into that! I’m an Audible junkie, time flies by when I’m stitching and listening. I’m currently listening to Philippa Gregory “The Last Tudor”, I have listened to nearly all of her books. My favorite category is historical fiction but enjoy a variety of genres. My next listen will be Ken Follett’s new book “A Column of Fire”. I have an immense library and am always looking for recommendations from others. Hi from Brisbane – The Caine Mutiny, Winds of War, War and Remembrance by Herman Wouk. Fantastic stories and narration. What a writer. Oh, and Thomas Berger’s Little Big Man. So funny. Thanks for the recommendations. I’m very lo-tech and when I want to listen to something (sometimes I just like silence) I play some of these 5 or 6-hours long Youtube classical music videos. They last me for a few sessions and when they’re over I pick another one. When I stitch at events where I am demonstrating needlework there is all sorts of activities and noise around me. At reenactment events while I am stitching and speaking with people about stitching in period (and a bit about the history of stitching) there may be muskets being fired or even a cannon. Others are talking about what they do – horn working, silversmithing, writing with a quill pen, spinning, weaving, foods & cooking, a soldier’s life, etc. I am hearing all of that while stitching. When at the Long Island Fair with my EGA chapter there are crowds of people coming past us while we stitch – shouts of children seeing if they won a ribbon, people seeing the outside events through the door, and so on. As far as podcasts go, Point North Media does academic analyses (his American Gods recently was fantastic) and Caustic Soda has a lovely back catalogue of quirky science (they stopped last year). Other highlights are Wits radio humour recordings and dramas such as Steal The Stars. Bless the internet & smartphones for the ballooning quality of content! Thank you for your work, Mary. Oh gosh, audiobooks! I’ve found another addict! My iPod is always in my pocket (or tucked in my bra if I don’t have a pocket) with my earbuds slung around my neck like a doctor wears her stethoscope waiting for a time when I can pop them in and listen for a bit. While I like music and podcasts, mostly I listen to books while I clean, cook, drive, stroll, wait, take a nap, iron, garden, crochet and, yes, embroider! I use my local library to borrow audiobooks via Overdrive and, of course, I too am an Audible member and have been for many years. I have no idea how many books I own but it’s a LOT! My guilty pleasure discovered in only the last couple of years are the romance novels set among British royalty :~D – Authors like Eloisa James, Lisa Kleypas, Julia Quinn, Mary Balogh and others, read by talented narrators like Susan Duerdon and Rosalyn Landor, can “take me away”. They are, of course, pure fun (and often quite funny!) Molly Harper’s funny fantasy fiction set in the American South as read by Amanda Ronconi are also enormously entertaining while I stitch away. You didn’t mention Audible’s Daily Deals. Every single day they offer members a book for somewhere between $2 and $6. I check to see what’s on offer every day because you never know what you might discover and – as you said – if you buy it and don’t like it, they will take it back. And their customer service is always truly top drawer! Thank you for this information. Somehow, this is the first I’ve learned of Librivox. It’s amazing! OMG! You ARE a woman after my own heart! I listen to books constantly while I drive & stitch & … well all the time! I have the option of having many city & county libraries in my area & I have a card at ALL of them. I LOVE audio books & don’t have a TV and you have some of my favorite authors listed. I have been interested in Audible for awhile but haven’t had the time to actually look into the details about it. THANK YOU!!!! Previous Previous post: That Color Splashy Embroidered Kaleidoscope Thing – Again. Next Next post: Octoberfest! Autumn Embroidery with Specialty Threads – Available Now!